In this episode of “Can These Bones,” co-host Laura Everett talks to airline executive Marty St. George about the importance -- and practice -- of instilling shared values across an organization. Ask any JetBlue Airways crew member the company’s five values, and he or she can rattle them off: safety, caring, integrity, passion and fun. Naming those values isn’t just a rote exercise, says Marty St. George, the executive vice president for commercial and planning at JetBlue; it reflects deeply held convictions that guide decision making at every level of the company. In this conversation, St. George and “Can These Bones” co-host Laura Everett explore the lessons an airline executive can teach Christian leaders about creating a healthy organizational culture through team building, leadership training and talent cultivation. Laura Everett: From Faith & Leadership, this is “Can These Bones,” a podcast that asks a fresh set of questions about leadership and the future of the church. You spoke with Marty St. George from JetBlue. Tell us what an airline executive can teach us in the church. Laura Everett: I think Marty can teach us a lot, actually. Marty is an old friend of mine, and he’s my go-to conversation partner when I have a question about nurturing organizational culture -- in part, because JetBlue has such a strong brand identity. JetBlue is a relatively new airline company. It’s a low-cost carrier with 101 destinations, and it’s got a reputation for providing good customer service and some pretty sweet perks, like free Wi-Fi and free blue potato chips. And so even though our objectives are quite different in the church and a for-profit corporation, I’ve learned a ton over the years of hearing how an airline exec like Marty thinks about things like team building, talent cultivation and having lots of people, at lots of different levels, in lots of different places, committed to the same set of values. So my friend Marty St. George is an executive vice president for commercial and planning at JetBlue. He joined JetBlue in 2006, and he’s worked at other airlines. He thinks a lot about innovation in the airline industry, in the same way that I aspire to think about innovation in the church. I’ve found him generous in sharing his experiences, and I see Marty strive to live out his faith and values in a way that shows grace in an industry where people can often be tired and cranky and unnecessarily rude. I recognize that talking to someone who’s in charge of making a profitable business is unusual for church folks. But I’ve found it really helpful for me to talk with Christians in other fields, even if their institutional objective is quite different. Bill Lamar: Let’s hear your conversation. Laura Everett: Marty, welcome to “Can These Bones,” a Faith & Leadership podcast. Marty St. George: Thank you so much, Laura. I appreciate it. Laura Everett: Really glad to be with you today. So, first question: Did you fly to work? Marty St. George: I did not fly to work today. I do on occasion fly to work, but this was not one of those days. It was the train. Sorry to not fulfill the stereotype. Laura Everett: You started out in trains, right? Marty St. George: I did. Very, very early on. And once I found airlines, that was it for me. Laura Everett: What was it about airlines? Marty St. George: I have a -- completely misunderstood by myself, until recently -- fixation on the concept of connections. And if there’s one thing that airlines do, it’s connect people. It’s connect people with their jobs, with each other, with places in the world they’ve never seen, with their families -- you name it. And when I would go in an airport and see all these people scurrying around, trying to get from point A to point B -- I really like it. One of the things about JetBlue is that it’s a very flat organization. We have 21,000 crew members, and we are all called “crew members.” Historically in the airline business, that [term] means people who fly airplanes. That’s not at JetBlue. At JetBlue, everyone’s a crew member. The CEO is a crew member; I’m a crew member; the man or woman who handles baggage at JFK is a crew member. And part of the culture is that during the peak holiday periods, [the executives] will go to the airport and help. It’s either telling customers where to go, throwing bags -- I mean, you name it, whatever we can do. And I realized, being in that environment, the airport, and seeing what we do as a business -- and I’m not saying just JetBlue, what we all do -- it actually, you know, I didn’t have the self-awareness to know why I was so drawn to it, but now I get it. Laura Everett: At one point, the slogan for JetBlue was “Bringing humanity back to air travel.” Where did that decision come from -- that it wasn’t just an objective to get people from point A to point B as quickly as possible, but there was something about the travel itself that JetBlue wanted to invest in? Marty St. George: Well, air travel is what I call a derived demand. People don’t buy airplane tickets because they want to be on an airplane. Well, I do, because I like to fly, but most people buy them because they need to get somewhere. It’s the old line, when you go to Home Depot to buy a drill, you’re not buying a drill; you’re buying a hole. People don’t buy the plane ticket because they want to buy a plane ticket. And airlines, over the period since deregulation, I think, have more and more commoditized the experience. So -- and by the way, I appreciate everything you said about JetBlue. I will take no credit for that, because it was really the founders of the company back in the late ’90s who had this idea. Most of them came from other airlines. Not all, but most of them had seen the commoditization of the business and the fact that we really had lost this concept that it is fundamentally a service business. We are in the service business. So when the founders sat around the table trying to decide what their plan was for JetBlue, they actually, very early on, before they had a route network, before they had a fleet of planes, before they even had an idea of those things, they sat down to talk about the mission and the values. So the original mission of JetBlue was “Bringing humanity back to air travel.” And it came from that core insight that it is fundamentally a service business -- and it’s a business where very few airlines are focused on service. At the same time, we also started with values. What are the guiding lights that we’re going to have to make sure we can fulfill the mission? So the company has five values. They have not changed since day one of the company. And for those of you who are listening, if any of you know JetBlue crew members, first of all, tell them I say hello. Second of all, ask them the five values. I guarantee you, every single one of them will tell you the five values: safety, caring, integrity, passion and fun. Which basically is how -- my description of that is, “This is how we do things.” That’s how we get things done, by following those five values. So from your first day at JetBlue, you know the mission and you know the values. We actually changed the mission several years ago. After 10 or 12 years of success in bringing humanity back to air travel to a certain extent, I think we felt like we should take a bit of a victory lap. We’ve shortened the mission, and we call it “Inspire humanity” -- and very deliberately with a double meaning. First of all, inspiring humanity amongst each other and amongst our customers. But secondarily, I think also to be an example of humanity in the greater business world. So I think from that perspective, it was sort of a natural morphing of JetBlue. But back to the original point: it would be very difficult to get hired at JetBlue if you do not know the mission and values in your interview. When you walk in the door, you immediately understand why the mission and values are so important. And frankly, you hear these words. I don’t think there’s -- I wouldn’t say every day -- but there’s certainly not a week that goes by that we do not reference the values in the senior-level meeting. Because so many of our decisions need to be made through that filter. Now it’s like breathing; values truly are deeply held. You don’t need to remind yourself of them every single day, because that’s how you live your life. So it really is part of your life. That’s why I would challenge anyone to ask their friends [who work at JetBlue] what the values are. They know them. Laura Everett: Part of what’s so fascinating to me about JetBlue is you all have been explicit about values. A lot of institutions say that, but they don’t always enact it. So what do you do to make those values real? Marty St. George: Well, first of all, the values really are part of your onboarding process. And you experience the values in your first day, your first week, your first month, throughout your experience here. And I think it’s important to say, our first value is safety. Rules are really important. You know, there are places where we do not want our crew members to innovate, because it’s very important that you do things exactly the same way every single time to make sure that you’re running a safe, secure operation. But the last place I worked, the rules culture had gone so extreme that they had this thing there called “regs”; regs is short for regulations. In the building, in the headquarters building, you could look at regs. And regs were a set of three-ring binders probably 4 to 5 feet long of a bookshelf. There was a rule about everything. And when I say everything, I mean everything. At JetBlue, we don’t really have that. We have a thing called a Crewmember Blue Book. And the Crewmember Blue Book is sort of the blanket rules and regs as far as how we do things. But it’s very, very short. And our crew members are encouraged to -- we use this phrase internally all the time -- “do the right thing.” What is the right thing? If you can do the right thing and do it consistent with the mission and values, it is very tough to get in trouble with JetBlue. And there are legions and legions of examples of things that we do. I could spend this entire podcast telling you stories. And I won’t, for two reasons: first of all, I’d use up all the time, and second of all, I’ll start crying, because some of the stuff we’ve done has just been incredible. But I think that is the culture. I mean, that phrase “culture” -- what does “culture” mean? Culture is how we do things. How do we do things around here? That is the culture of the company. Laura Everett: So let’s go back for just a second. You said that when people become a new crew member at JetBlue, that immersion into the values of JetBlue -- those values of safety, caring, integrity, passion and fun -- starts on day one. Or, it sounds like, start in the interview process before you’re hired. What is the onboarding process for a new JetBlue crew member, whether a baggage handler or a pilot or someone who is working in the cabin? Marty St. George: Well, it’s a little bit different at JetBlue than other places I’ve worked. Everyone’s first day sort of has the same experience. We fly our crew members to our training center in Orlando, Florida. And we have a smaller training center in Salt Lake City for some other crew members. But the largest one is in Orlando. And you spend two to three days in something we just call orientation. And orientation sounds very, very, very innocent. The initial perception of orientation is this is, “I sign my insurance forms; how does vacation work; let me get a logon for the intranet; where is the bathroom” -- things like that. That’s not really what orientation is about. Orientation is two days of culture school. And it’s a very, very formal program. We do it more or less the same every time, and everyone goes to orientation together. So, for example, I went to orientation in 2006. I was a vice president and so probably one of the top 30 people in the company at that point in time. And I was in orientation with baggage handlers. I vividly remember having a conversation with two baggage handlers from Boston, one of whom had never been on an airplane before we flew him down to Orlando. So it is truly the first time when it is really crystal-clear to everyone within the company that you’re all the same. There are only two [types of] people in this room. You either serve a customer or you serve the people who serve the customers. That’s it. That’s everybody’s job. We use this phrase internally -- “Our goal is to create citizens and not consumers” -- among our crew member base. We don’t want people who are just here for the paycheck. We want people who want to contribute. Every single person who moves from crew member to crew leader has to take a course called “Principles of Leadership” [POL]. And what it basically does is it teaches you how to manage. You know, it’s funny, because someone who had worked for me at a previous company, who was just an outstanding contributor, I remember giving her probably her -- not her first review -- like, her second review at my previous company. She was just stellar, one of the best people I’ve ever worked with. And it’s funny, the first day of POL, I walked out of POL and I was driving home that night and I got on the phone and I called her up and I apologized. Laura Everett: How can you tell when the values are working well? Marty St. George: We had a service failure that was relatively well-known across the company, and it was very painful for us. And a lot of lessons were learned in the company when this happened. When our crew members are saying that -- when that’s the language they’re using to us -- that’s when we know we’ve been really successful at making sure this is part of the culture. And that really -- I mean, listen, service failures are painful. But when it’s not just crew leaders, but front-line crew members are trying to interpret them in light of the values, that’s when we know we’ve done a great job. Laura Everett: When you can hear crew members articulating those values back to you. Marty St. George: Yeah, it’s not us telling them; it’s them telling us. Laura Everett: So let’s dig at one of those values for just a sec. Because I think you’ve got some good stories to tell here that might be illuminating. Let’s talk about that “fun” value, because this is part of JetBlue’s image and reputation -- that there’s something joyful and pleasant about the experience -- and crew members have been a part of that. What’s a good story you’ve got about when crew members felt empowered to have a little extra fun because of the values of JetBlue? Marty St. George: Sure. Well, I mean, I’ve got a ton of stories. I’ll tell you the one that comes right off the top of my head. We had a Boston-based crew that was flying on a flight from Boston to Vegas. And as you can imagine, the Vegas flights tend to be a little raucous at times, at certain times of the year. In a good way, but still raucous. But the crew members were interacting with the customers -- and again, it’s tough to be an in-flight crew member at JetBlue if you don’t love people, you don’t like to interact with people -- so that’s quite normal, course of business. And one of our flight crew members, this guy Chris, who I’ve gotten to know pretty well, started talking to a couple of customers and found out that they were eloping to Vegas. And I still remember the pictures. The guy was in a Patriot -- in a Tom Brady shirt -- in a Patriots shirt. Marty St. George: The woman was just dressed normally; they were flying out to elope. And I think their original goal in telling that was to maybe get a couple of free drinks, which is a great idea, and I’m sure he did that; I don’t know for a fact. But what this turned into was Chris held an in-flight wedding. Marty St. George: So -- he did. Our crew members are quite resourceful with the resources we give them on the airplane. So I believe he used a blue garbage bag to create a little bouquet of flowers for the bride. He, I think, used a couple of napkins to create a little bow tie for himself. He brought them up to the front of the airplane, and he and the other two in-flight crew members and the couple had a little wedding ceremony at the front of the plane. Now, I’m sure when Chris did this, he had no expectation whatsoever that this would become any sort of an event. But as usually happens in the 21st century, there were customers on the airplane who were using social media and put stuff on Twitter, Facebook, etc., and it ended up becoming a little news story. He basically was going to do what it took to make sure those customers had a great experience, and also that the other customers in the airplane could have a little fun. So it’s that sort of thing. I mean, the actual experience that those customers had is exciting, but what excites me more is that our front-line crew members feel that empowered to do something like that. Those are my favorite stories -- I love when they feel they can do those things. Laura Everett: And this, really, this sense of empowerment among crew members is also related to another part of your portfolio, which is the marketing piece, right? Laura Everett: So we’ve talked a little about how values are a part of the JetBlue culture among crew members. How are the values part of the experience with customers? Because it seems like, when you’ve got the person in 17B who’s watching Chris preside over a wedding -- frankly, encroaching on my territory -- and that person in 17B takes a photo, uses the free “Fly-Fi” on JetBlue, tweets it out, you get a ton of good publicity that reaffirms the values proposition that you started with. How is the values piece built into how you think about marketing for JetBlue? Laura Everett: [Laughter] Look, I use it! Marty St. George: You did, I know. I appreciate that. I’ll just go through a very current example. This summer, where in the midst of Hurricane Irma hitting Florida, we made the decision that -- obviously, what we do is we move people, and there were a lot of people who wanted to get out of Florida -- and we made the decision that we were going to offer all of our seats out of Florida for $99, in the light of some of our -- actually, I think all of our competitors, who were letting the prices go to $600, $700, $800. And by the way, I’m not casting any aspersions. If you let -- if you leave the computer model alone, that’s what it will do. Because the last seat on the airplane costs more than the first seat on the airplane. I totally understand how it happened. Long story short, we made a conscious decision to override the system so that we could sell as many seats at a low price as possible. Would it be nice to get that extra X million dollars? Is it going to help me make my revenue goal? Absolutely. But at the same time, we are inspiring humanity. It’s not the right time to take advantage. So that culture goes across the company. Interestingly enough, we did not even make an announcement about it. We just did it. One of the two senators from Florida made an announcement, and then that also became this gigantic viral news story. I look at that experience, and I think to myself two things. First of all, it’s good that we can live the values and have that impact, our day-to-day decisions, just like Chris did. And second, I think it’s great for the rest of our crew members to see that we do that, because I think it actually helps support them when they make decisions like the decision that Chris made on that airplane. Because they recognize that all 21,000 of us are trying to live the values. It’s not just something we’re expecting our front-line crew members to do when they’re in front of customers. Laura Everett: So you have a sense that when, like, the corporate leadership of JetBlue makes a decision to cap airfares in the wake of a hurricane, that that reaffirms the values for front-line crew members. Marty St. George: Absolutely. And I think it’s a -- these are things that you don’t have to say explicitly. They get it. They understand the mission. They know the focus the company has on service and on serving customers. And certainly, if you look at our intranet -- we have a lot of private Facebook groups for our own crew members -- they have all just been incredibly proud about the stuff that we’ve done. And there are countless examples like that, where we have stepped up with pretty significant investments of company resources to try to live those values. I’ll just give you one more quick one, when the Pulse nightclub shooting happened in Orlando. First of all, Orlando being the home of our training center and one of our six focus cities, we have a very large JetBlue crew member base [there]. Thankfully, we did not have any crew members in the club that night -- excuse me, at the time of the shooting. We did have some crew members who had left before, so it came very close to home for us. But also there was a very heavy contingent of Hispanic customers, mostly Puerto Rican customers, in the club that night who were victims of the shooting, and we’re the largest carrier in and out of Puerto Rico, including from Orlando to Puerto Rico. So we immediately went into action. We offered families free travel back and forth between Puerto Rico and Orlando to come either support their loved ones or, in unfortunate cases, come make arrangements for the loved ones who had passed away. It was a decision that was made within -- it was a Sunday morning that that came out, and I think we made that decision in about 15 minutes. It wasn’t even a question. Laura Everett: There’s something pretty remarkable for me about how JetBlue is not just professing the values but living them in every component part of its business -- not just in how you care for customers but also how you care for crew members. Marty St. George: The company was founded by two men: David and Dave. And David and Dave are, in the origin story of JetBlue, those are the two names you hear over and over again. And one of the lines that they used repeatedly -- and they’ve both since left the company -- one of the lines they used repeatedly was how vital it is that we keep JetBlue feeling small as we get big. Because scale is absolutely something we worry about. And I think if you were to ask most of the crew leaders at JetBlue what your biggest concern is, it’s not competition. It’s not the price of fuel; that goes up and down, and we manage that. It’s how do we make sure we preserve the culture. So many decisions are made in that light. And I think the ability to use corporate resources to try to improve that relationship with our customers, to fulfill the mission of inspiring humanity, and to also reaffirm that with our front-line crew members -- I think that’s priceless. And if you look at the reaction -- I’ll just go to the $99 fare out of Florida -- look at the reaction that we got from just regular, normal, ordinary customers when they heard that story. Those are the people who are going to come back and fill flights. Once the hurricane has passed and we’re back to normal, you know, these are the people who remember. Laura Everett: I know that one of the questions that first-call pastors often ask is, What do you change, and how do you know what not to change? So there are some things that JetBlue has added, like the free Wi-Fi or the unlimited blue potato chips, that build a ton of goodwill, I imagine, and don’t add a ton of cost. With the values that you’ve got, how do you know what are the spaces where you’ve got some flexibility, and what are the sacred cows that you dare not touch? Like, if you took away those blue potato chips, would that mess with the entire company? But at the end of the day, this is part of -- we have a stewardship not just to our customers and our crew members but also to our owners. And we have to balance all three of those. Now, I would say that it’s very important that we focus on how to communicate these changes to our crew members, because they’re surprised. We went through one other change in the last, I guess it was probably three or four years ago, that was also extremely controversial. I shouldn’t say controversial; it was a difficult change within the company, which was that we added what other airlines would call a first-class product. We’ve had five values forever. What’s the sixth value? The secret sixth value was egalitarianism. Which is everybody gets treated the same. And we took that as a badge of honor. Because we wanted to make sure that we did not have the same experience as other airlines. Because he gave them hundreds of thousand dollars, and if you’re a top customer at a legacy airline, you have a pretty good life. They treat you very well. But if you’re the one-time-a-year customer, you don’t get treated incredibly well. So our goal at JetBlue is that every single customer gets treated really, really well. So when we went out there to our crew members and said, “Hey, we’re looking at trying to design this first-class-type product because we think we can make a lot of money, and it’ll be a really, really good service,” they recoiled. You go back 10 years, we actually screened for that in the interview process, that people could treat everybody the same. Like, that was a really core value that we didn’t even really understand. And as we explained the concept of Mint -- we call the product Mint, by the way; we don’t call it first class. But as we explained the concept of this premium product, what we said to our customers was -- excuse me, what we said to our crew members was, “You remember when we had this conversation about we want to provide really, really great service at really low fares because our competitors are giving something else? Laura Everett: Well, I love that story, too, Marty, because in adding the new premium product in Mint, you went back into your history to reclaim some of your own tradition at the company to invite new crew members on board. What are those five core values of JetBlue again? Marty St. George: Safety, caring, integrity, passion and fun. Laura Everett: One final question, Marty. We’re in this moment where lots of people want lots of access and availability, all of the time. I’m sure you get a ton of emails every day, and text messages, that are both personal and professional. Talk to me about your phone. How do you manage a productive, healthy, maybe even holy relationship with it? Laura Everett: Is it a struggle for you? Marty St. George: I do not have a healthy relationship with my phone, unfortunately. In fact, I turned my phone off for this conversation. I think when I open it up -- I just turned it on -- I believe it will tell me -- and give me 10 seconds to tell you -- yes, I have 6,839 unread emails in my inbox right now. Marty St. George: That’s both personal and my work email; I do not have that many work emails unread. But it’s a real challenge. I certainly -- we are a 24/7 business, and I certainly have had multiple examples of having the work world interrupt the real world. And I think if you asked my family, they would tell you I’m horrible at it. So I have zero good advice for you or the listeners on how to fix that. Marty St. George: It was my pleasure. Thank you. Bill Lamar: That was my co-host Laura Everett’s conversation with Marty St. George, executive vice president for commercial and planning at JetBlue. Laura, there was much to learn. First of all, generally speaking, say more about what you think we can learn from folks in business and other fields. Because often, the church has conversations [only] among ourselves. How might this leaven our loaves? Laura Everett: Well, I think first, one of the reasons to have conversations with people who work in business and in other fields is because often, those are people who go to church. We treat them like they’re some sort of foreign entity that has nothing to do with a life of faith, but these are also our parishioners. They’re our neighbors. They’re our colleagues. And they have wisdom that they’ve learned in their professional lives and vocation. I think it’s really helpful to speak with folks who learn how to lead other institutions in ways that help us strengthen our own. So for me, being in conversation with Marty is being in conversation with someone who sits in the pews on Sundays, but also someone who has taken their professional life in service of innovating in a pretty tight field. So I’ve been able to learn a lot from him. Bill Lamar: You know, Laura, one of the most challenging issues for me as a pastor and someone working in denominational spaces as well is, How do we do leadership training well? Like, every local church that I know in every level of our church and every level of other denominations -- there’s this mandatory leadership training that probably becomes often as bland as dining on wood chips after a while. So how do you do leadership training well? Marty said that everyone at JetBlue who moves from crew member to crew leader must be trained in what he called POL, principles of leadership, and I found that fascinating. I’m struggling with that myself. What insight did you glean, and how are you working with that with the [Massachusetts] Council [of Churches]? Laura Everett: Sometimes the meal is wood chips. Sometimes it’s just sawdust. It can be really rough out there, and I think there are resources in the community. I mean, first off, Leadership Education [at Duke Divinity] is a resource, clearly. But talking with parishioners who do leadership formation in their own day-to-day life is another resource at our disposal that I don’t think we take full advantage of. So part of what’s so interesting about what Marty was talking about in learning how to manage is that everybody [at JetBlue] who moves into management has to go through this training process. But God knows, if you move from being an associate pastor who is supervising and leading volunteers to being a senior pastor, or move from being an associate director to being the executive director -- I didn’t get any formal training in how to manage colleagues. What are best practices? How do you manage people differently based on what their strengths and models of feedback are? You know, for me, going to Foundations of Christian Leadership at Leadership Education was a lifesaver in some really rough waters, but I still feel like I could get a lot more formation on how to manage colleagues well. What are you learning about how to do that, Bill? Bill Lamar: Well, what I’m going to do right now, because of what you have shared, is to get all the people at Metropolitan who do any type of leadership training together and have a conversation. I think that’s exactly -- I think with their wisdom and our shared values, if we move that into discussions both theological and political and other commitments that we have as a church, I think that we can come up with something. I think that it could be that we have this wisdom deficit because we are afraid -- maybe “afraid” is not the right word -- but we are not engaging the gift sets of folk in the pews. And here is something that you mentioned that is very interesting that connects with Marty, about how you give feedback. Now, I’m called to do that often. And I know that I can grow. But Marty talked about a very gifted woman -- he gave her feedback, and he only talked about her growth edges, and she was crying, he said. And she said, “Please” -- in the words of the song -- “tell me something good.” Just a little, just please, please, tell me something good. Bill Lamar: So that was very helpful. And I think having the kinds of conversations when you have to do feedback -- I think first of all, we should share as leaders, anyone who’s a leader or pastor or an institutional leader, share with groups how you best receive feedback. And we’re not always as good at following up on that. But I think there’s real wisdom, if we have the humility to say that we are not finished, that serving the church requires our first fruits and our best work, then we’ve got to be proactive in asking for feedback and not just building organizational patterns of receiving it when we’ve done something wrong. So that we build in a practice of gratitude and excellence and invitation for feedback. I’m still not there yet at the Council [of Churches], but we’re getting closer in building that into our organizational life. Bill Lamar: Laura, here is something that will not surprise you. I recently had a meeting with what we call our Stewardship and Finance Commission, the wonderful money people who take the resources the folks are willing to give to Metropolitan and figure out their best use in accord with our vision and mission and strategic plan -- and investment. How do you know when to invest, and how to invest? So Marty talked about the $99 flights and the blue potato chips and the Wi-Fi, and he talked about how expensive that is. I mean, the millions of dollars that they invest in blue potato chips and Wi-Fi. And I’m really, as a pastor, trying to figure out -- when resources are constrained, often, you still must make investments. How do you do that? How do you think about that? Laura Everett: The conversation that Marty and I had about not raising the airfares in a time of crisis -- we actually recorded it before Hurricane Maria hit Puerto Rico. And one of the things that JetBlue actually continued to do following the hurricanes in the summer and early fall of 2017 was keeping prices low. So my observation of that was in a time of crisis, they actually went back to their values proposition -- safety, caring, integrity, passion and fun -- and assessed how those values were going to lead in a time of crisis. And made the decision not to raise fares, even though that would have been a really good time to make a bunch of money, if making money were your only value. I think, for me, the question around investing in times of, let’s say, organizational anxiety -- so one of the values of [Massachusetts] Council of Churches that we’ve articulated is delight. In my experience, when Christian organizations get anxious and tight, we forget that, like, this is supposed to be good news. It’s really hard to be joyful when you’re worried about rent and payroll and if you’ve got enough people to do the things you’ve said you’d do. And so one of those filters, for me, is asking, Does this bring me delight? Does this bring God delight? Will it bring delight to the people that we work with? So I think, for me, having that strong values filter to run everything through and then giving ourselves permission to not do other things so that we can invest. So that our no is our no and our yes is our yes. And so that yes can be clear and strong and directed to places that need additional investment. Bill Lamar: Something that Marty said that resonated with me: he said he’s not most anxious about rising fuel costs or competition but he wants to ensure that the organizational culture remains intact. And it is fascinating to me that the most valuable thing for him is the culture of the organization, and that that must be preserved. And it was such a breath of fresh air. I was wondering, how do you get to that place where people in our institutions say, “What is most valuable is preserving these values that we articulate are resonant with the gospel and what we’ve been called to do”? Laura Everett: Right. A theme we’ve touched on in previous episodes -- there’s a real question about scale in this, too. When you’re a one-person operation -- and I know many of our listeners are solo pastors or folks serving as the only staff person to a nonprofit -- when you’re just one person, it’s not actually that hard to hold on to the values. You’re the one in charge of that. But as you scale, as scope and scale expands, how you do organizational culture and shared values across a wider group of people, a wider network of volunteers, a wider community, I think, is a real challenge. And so Marty was talking about, How do you do those values across 21,000 employees spread around geographically doing really different kinds of work? I feel like I’m asking that question about, like, three people or my board of seven or my network of 3,000 churches in Massachusetts. So two things, Bill, I would think of. One is, I went on a visit to Ebenezer Baptist Church in Atlanta a couple of years ago and was warmly welcomed as a guest. Sat down. Pastor gives the welcome, and then he says, “At Ebenezer Baptist Church, we believe …” and the entire congregation finished the sentence. Everybody in unison said the vision statement of that congregation. It was a remarkable moment, because you realized that that vision that they had cast was shared across the people who were there. And I looked around. They were not reading out of their bulletins. Folks had that memorized. They were talking seriously about what the vision was of that community. And I know -- I heard Marty say it, but I know it’s also been true for me -- I know that the values and the vision are getting some traction in my own organization when people start saying it back. Not that I’m saying it, but that other folks are saying it, too. And I thought, “Oh, yes! I’ve been saying this, and somebody else is saying it.” Those moments when other people in your web of relationship are reflecting back the values, for me, is that touchstone of when I know things are sort of penetrating and expanding. Bill Lamar: It was a fascinating conversation, and I learned quite a bit. And I think there’s much to glean for our listeners who are doing the good work in the communities of faith around the country. Laura Everett: Thanks for listening to “Can These Bones.” I hope you enjoyed this conversation as much as we did. There’s more about Marty St. George, including other interviews with him, at www.canthesebones.com. 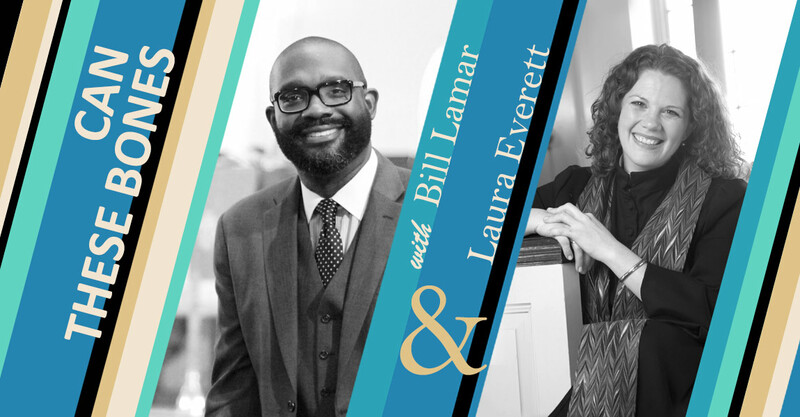 Bill Lamar: I am really, really excited about my conversation with Yolanda Pierce, the dean of Howard University Divinity School here in Washington, D.C.
Laura Everett: That sounds really good, Bill. I’m looking forward to it. “Can These Bones” is brought to you by Faith & Leadership, a learning resource for Christian leaders and their institutions from Leadership Education at Duke Divinity. It’s produced by Sally Hicks, Kelly Ryan and Dave Odom. Our theme music is by Blue Dot Sessions. Funding is provided by Lilly Endowment. We’d love to hear from you. Share your thoughts about this podcast on social media. I’m on Twitter @RevEverett, and you can find Bill @WilliamHLamarIV. You can also find both of us through our website, www.canthesebones.com.